Although paella is known throughout the world and considered by many to be Spain's national dish, it actually is a regional one, from Valencia, which is an area found on the east coast of mainland Spain. However, its history goes back centuries and originates in the medieval state of Al-Andalus, which was a Muslim controlled area including parts of Spain, Portugal and France. It was the tradition, back then, to prepare large pans of rice and fish with various spices, for such things as large family gatherings and religious festivals. 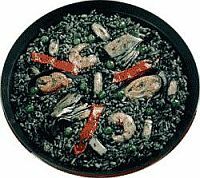 Thus was established the custom of eating rice in Spain. The large pan used to prepare it was called a paellera and, in around 1840, the name was shortened to become the actual name of the meal itself. If you thought that the ingredients of this dish were a touch exotic today, think again. Very early paellas used water vole (honestly), eels and butter beans. As people became more prosperous, ingredients began to get a little more upmarket. Thus, there was the inclusion of such things as rabbit, chicken, duck and even snails on occasion. As you can see, there is no seafood on this list. 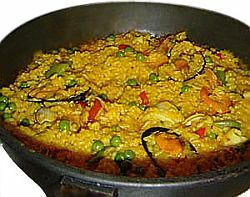 Many people's idea of paella is a rice pan crammed with such things as prawns, mussels and shrimp. Indeed, this is a type favoured by those Valencians situated right on the Mediterranean coast, but the main type is meat. The rice which Valencian chefs generally use is called bomba, a short grain variety grown in the area of Calasparra, a municipality found in Murcia, a region just south of Valencia. This is the most suitable because it absorbs more of the broth than other rices. In a true paella, there has to be a layer of toasted rice at the bottom of the pan. If the dish is cooked on an open wood fire, this happens automatically. If cooked in an oven, the pan must then be placed on an open flame to achieve this effect. This toasted rice is considered a delicacy. Today, there are three different varieties of this dish - Valencian, Seafood and Mixed. You're literally given free reign as to what goes into one of these. The only stipulations appear to be salt, saffron and garlic and tomatoes (plus the rice, of course!). Thus, you may find any of the above ingredients, plus such things as chorizo sausage and red peppers. As is the case with so many dishes like this, there are hundreds of regional variations. You may have seen one with black rice. In actual fact, this is not strictly a paella and the title "black rice" is also a misnomer. The rice is, in fact, normal white colour and the blackness comes from the cuttlefish ink that is part of the recipe. Taking a look at that image, I'd have to admit that it's not for me! 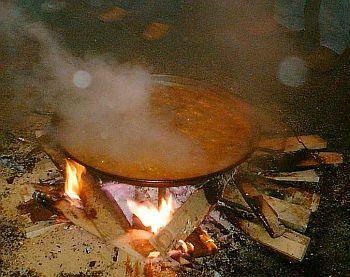 This ubiquitous dish can often be found, being prepared in a huge pan in the open air, during one of Tenerife's many festivals. All the attendees of the festival tuck in and help themselves. Communal dining!